Türkbükü is located on the Turkish Riviera on the opposite side of the Bodrum peninsula from the town of Bodrum. 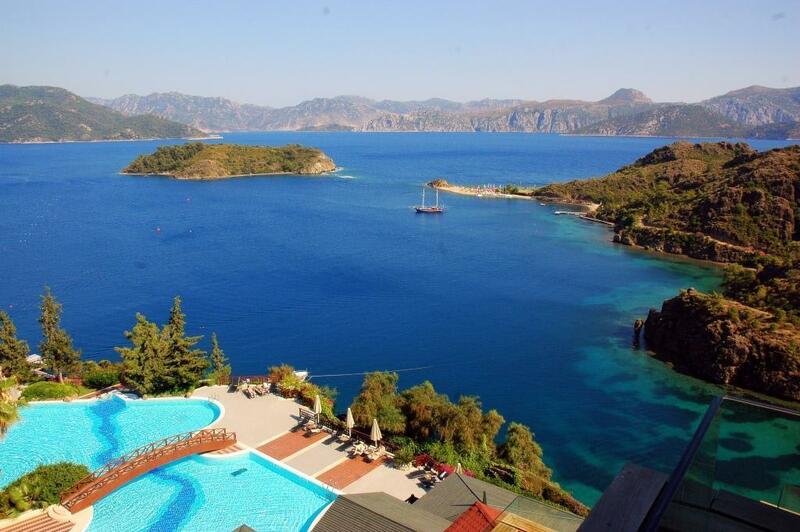 Türkbükü has a well-protected harbor ringed with high hills containing a number of luxury hotels and holiday villas. It has islands at the entrance of the bay. Other cape of Gölbükü bay and these islands protects the bay from waves. The town is a favorite vacation spot and second home residency of upper-class Turks and although less well visited by Western European tourists compared to Bodrum, also increasingly popular with foreign visitors. There are no broad sandy beaches in Türkbükü, but there is a semi-circular boardwalk dense with shops, restaurants, bars and docks for sunbathing in the day and dining in the evening. The protected harbor is a refuge for yachts and allows for swimming in swimming pool like conditions in the morning before the afternoon breeze comes in. In the high tourist season, Turkish pop-stars, models and professional athletes can be sighted at the posh bars and restaurants or strolling along the boardwalk, justifying the popular labeling of Türkbükü as the Saint-Tropez of Turkey. It is more or less certain that the significant historical remains on the hill dominating the bay of Türkbükü on the northwest side of the Bodrum Peninsula and Aşağı Göl Köyü at the shore of it are the remains of Lelegian town Madnasa. Friedrich Cornelius who did not have knowledge of this fact thought that Madnasa, whose name took place in the lists showing the amount of talanton paid by each town as an expense contribution to the Delian Confederacy read on the inscriptions found in Attika, was the Maeander Magnesia. Moreover he mistakenly stated that it is the same town as Maddunassa which took place in Hittite documentation and which was on the route of Tudhalia the Second on his war journey to Arzawa. However it is absolutely impossible that Lelegian Madnasa on the Bodrum Peninsula was Maddunassa because Bodrum Peninsula is nowhere to be stopped at from the country of Hittites to Arzawa countries; it is by the sea at the edge of mainland. It looks like the name Madnassa had been created from the elements of the Luwi language. It means it is the town of Ma country. We have little information about the history of Madnasa town mentioned in the works of Ancient Plinius and Byzantion Stephanos. From the Attika inscriptions mentioned above, we find out that this town paid 2 talanton (silver equivalent to 600 Atatürk gold’s) at first, then 1 talanton to the Delian Confederacy in the leadership of Athens in 5th century BC as an expense contribution. However this situation did not prevent it to be forced to "join" to Halicarnassus/Bodrum, in other words its people obliged to get transferred to Bodrum in the era of Mausolus; therefore history of Madnasa as an accommodated town ended towards the end of the first half of the 4th century BC (around 360 BC).